This time of year there’s an abundance of information on what people food your dog can eat and what they shouldn’t eat. But what about the other holiday dangers? Poinsettia, mistletoe berries, and walnuts are toxic to dogs. Glass ornaments that might fall off the Christmas tree and break could wind up in paw pads. 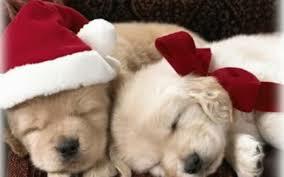 Pine water (from the Christmas tree) can make dogs sick if ingested. And finally, if your dog eats tinsle and it begins to come out the other end, don’t pull it out as it can do damage to the dog’s insides. Instead, let nature take its course. If the tinsle doesn’t come out within a few days, see your vet. I often suggest to clients that they fill a kong toy or hollow bone with peanut butter, freeze it, and then let their dog work to lick all of the peanut butter out. This can keep a dog busy for quite a while. While this is still good advice, we now need to be a little more careful when doing this. Some peanut butter companies are now using xylitol which is a natural sweetener that can be found in baked goods, toothpaste, and chewing gum, among other things. Unfortnately, it can be toxic to dogs. Small amouts of xylitol can cause seizures, low blood sugar, liver failure, and death. If your dog likes peanut butter you can still use it, just be sure to check that the ingredients do not inlcude xylitol. Freckles Macaluso is a Dalmation that comes to us for boarding, nail trims, and she did a Beginning Obedience class with us. Freckles is not much of a kisser but she is a huge hugger! Her good friends are Korah the Shepherd mix and Daisy the French Bulldog. Want to help your dog get used to loud noises? Become clumsy. Start dropping things like silverware on a hard floor, heavy books, a chain leash, anything that makes a racket. Then if your dog reacts, ignore him/her. If they react and you react to them, they will think there’s a reason to react. It’s okay for the dog to be startled for a moment and then recover (just like us) but that’s it. As always, if you have questions give us a call at 760-739-7299. Sandy Pawz Dog House is proud to announce that every one of our employees and volunteers are certified in Pet CPR and First Aid. This means that they know the signs of bloat, they know how to treat for shock and stop bleeding, and they know how to perform CPR and Rescue Breathing. Obviously we do all we can to keep all of the pets safe, but if something should happen, Sandy Pawz Dog House is prepared. We have Taste of the Wild Puppy food! We’ve been seeing so many puppies lately it just made sense. Just like the adult food, it’s wheat, corn, and soy free. So if you have a puppy and want to try Taste of the Wild Puppy food, come on in and ask for a sample. For the month of December selected retail items are 10-40% off, making Sandy Pawz Dog House a great place to do your Christmas shopping for doggy parents. We also carry gift certificates that can go towards any retail item or any service item. So come on in and make a dent in that Christmas gift list! Don’t forget, around the holidays our grooming appointments fill up early and boarding space at Sandy Pawz Dog House is limited and we’re already taking reservations for both. To ensure we can get you in, give us a call at 760-739-7299 to set up your grooming appointment or to reserve your boarding spot.